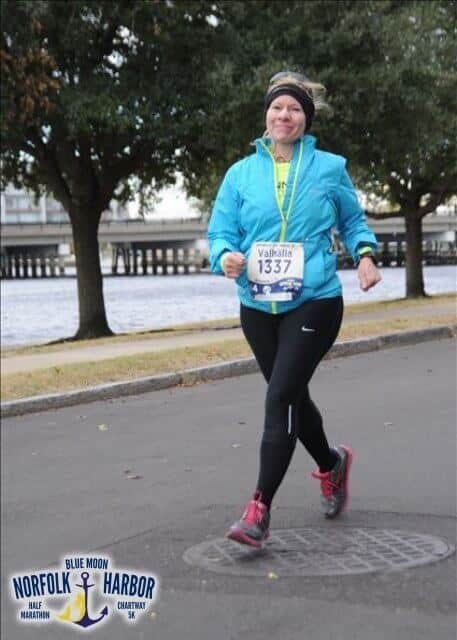 I recently invited Darlene Waters, a long-time member of our community, to write a race recap of her latest half marathon. Darlene struggles with many of the same issues that I do with both exercise induced asthma and pretty severe anxiety. What she emailed me was a heartfelt and beautiful narrative about dealing with and breaking through mental and physical barriers that come with running a race–and more than that, living a good life. I can’t thank her enough for the courage she has shown in sharing her story. I hope that some of you who struggle with the same issues understand that you’re not alone and you can reach out to others (myself and Darlene included) any time you need us. It was cold, it was windy. I made it to the Start Line. I made it to the Finish Line. It took me a few hours, and later, even over a week, to process the victories (yes, plural) of my race. I hadn’t set a PR, my training was nothing short of inconsistent, and I spent months in and out of physical therapy. The point, however, became and should always be, that running can be whatever you choose to make it. On November 19th, I chose for it to be a barrier I needed to hurdle in order to take back my life. Four years ago this Spring, I made the choice to be healthy. I educated myself on the importance of whole foods, exercise, and the damaging effects of all the opposites. In a matter of months, I eliminated most processed foods and added sugars, and began exercising regularly. In that same year, June 22nd, I decided on a walk home, that fulfilling the impossible—learning to run—was next on my list. Imagine my surprise when I got a half block into my run and almost keeled over; I couldn’t breathe. Exercise Induced Asthma & Vocal Cord Dysfunction, lying dormant since I was a teen because I had never been active enough since to trigger a reaction. Fast forward to many 5K’s,10K’s, a half marathon, and training for a full marathon later. While recovering from an Iliotibial Band (IT band) Syndrome issue, I was sidelined from the marathon I had been training for. Later in March, I was stalked by two men during a lunchtime run, and my household underwent major changes. All of these events created anxiety, depression, pain, and fear I was unwittingly packing away and not dealing with. I was strong, after all. I had already beaten obesity, given up medications I had been prescribed as a “lifer”, and healthier than people half my age at 50! I was planning to run my next half marathon… Except that I just couldn’t make it out the door to train for it. 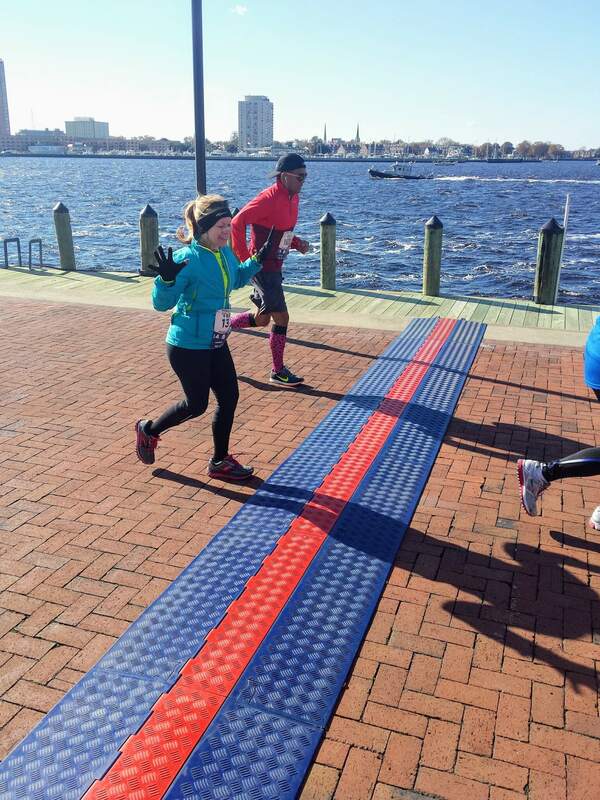 Looking for an excuse to DNS the Norfolk Harbor Half Marathon, I went to my physical therapist the week before the race. Following a thorough exam, she informed me, “You are not broken. It’s all in your head. You can do this”. Except I was broken. Maybe not mechanically, but for ongoing months, the sport I had fallen in love with now only made a mockery of me each and every time I stared down what surely was a hall long enough to house an entire train, as I planned to exit my front door for any run. I would stand in all my gear, at the door, wishing I could get beyond it, my hand on the door handle, then on the glass, feeling the day slip away. Some days I made it out the door. Most days I did not. Beloved crisp, fall morning runs were rationalized to afternoon runs when I couldn’t sleep the night before, fretting over having to lace up. The thought of the afternoon runs brought on shakes, cold sweats, and one excuse after another to eventually avoid going all together. I felt the dread of an old familiar pattern hanging over me; I realized all the “Never give up,” I’d ever chanted over the last 3+ years was now or never. I wouldn’t let go of everything I’d gained; my confidence, my strength, my fitness, my health, my happiness—my life. Wasn’t I the same person who had run through all inclement weather? Bought Swedish ice grips for my shoes? Finished my first half marathon in a knee brace? Check, check, and check. When I caught myself announcing with glee that a specific “TREADmill”, not a “DREADmill” I’d been eyeing was going on sale, I knew there was a serious problem. I like dreadmills as much as I would like a pencil shoved in my eardrum. Finally realizing there was a problem was half the battle, though. Over the years, I have been humbled by friends and family who have sought my help as they worked through their own challenges. It has been frustrating not to be able to take any of my own advice, as it seems none of those same courtesies ever apply to oneself. As I write this, I realize while I have gained much insight and growth, there is still work to do with regard to how I truly define self-worth. When race morning arrived, I opened my Garmin app to find proof I was capable of running 13.1 miles. Instead, what I found was a total of 8 training runs between October 1st and November 3rd, none of them overwhelmingly positive. The longest was 10.5 miles, and I had split it between the morning and afternoon. Part of my ongoing anxiety centered around the inability to run up to 9 miles—that’s the point my IT band was injured last fall. It had been 16 days since my last run. I panicked. It was 6:40 a.m. and the race started in less than an hour (pro tip: hometown races are your friend). And those running mantras—those beautiful mantras we read about? If you don’t have one, I strongly suggest you get one. Mine saved me. After crumbling in the bedroom, certain I wasn’t leaving the house, declaring I couldn’t do it, my auto-pilot kicked in. I went into the bathroom, looked in the mirror, and out came the mantra, “How bad do you want it, Waters?” I couldn’t not do it. I knew how bad I wanted it, how bad I needed to run this race. I needed to know what I was made of. In my rush to arrive on time, I had no warm-up, no stretching, nearly left my inhaler, and of all things, forgot to tape for my IT band. However, those are the only negatives of that day. On race day, everything I have learned in three and half years came to fruition. Every mental strength, any muscle memory, all the running words of wisdom I’ve carefully cataloged from veterans over the years, I pulled one by one from their safely stored places as I needed them. I faced every demon that had been hanging out and partying in my head for the last 6 months and ran them into submission. I left them on the pavement, trading 22 minutes of pace goal for personal victories. It wasn’t fast, and the last mile was a sincere struggle, but it was mine. My run. My 9-mile barrier, stretching to 13.1. My freedom from preying cowards. My happy. My body was in good shape prior to the race; I’m grateful I had the good sense to continue my indoor strength and stability workouts, even if I wasn’t running consistently. I finished the race with a very tight outer left knee and upper right hip. However, no swelling and nothing that did not respond to regular stretching and ibuprofen. Within a few days, most of my moving parts were in proper order, with exception to my hip area. That, though, returned to normal functioning by week’s end. Since the race, I’ve had no problems making it out the door. There are no panic attacks, no cold sweats, no rationalizing. The mental chains I left somewhere between mile 6 and the Finish line almost two weeks ago have been more freeing than I can express. Running proved to me all that was in my head—and now it’s not. PTSD, post-stress anxiety from worrying you’ll be re-injured, real life events that catapult you into a realm you believe you can’t go back to—real. Real, but with the capability of making you stronger than were. So, the next time you doubt yourself, don’t. Ask yourself how bad you want it, then go get it. I promise you, you’ll be glad you did. Author’s note: It is important to mention the love, support, and encouragement runners receive from not only our running community, friends, and partners, but especially those who solely support our habits and dreams out of the sheer desire to see us succeed. Without those people, we may never feel the self-worth to look inward and wonder how badly we want it. Thank you, Joakim.